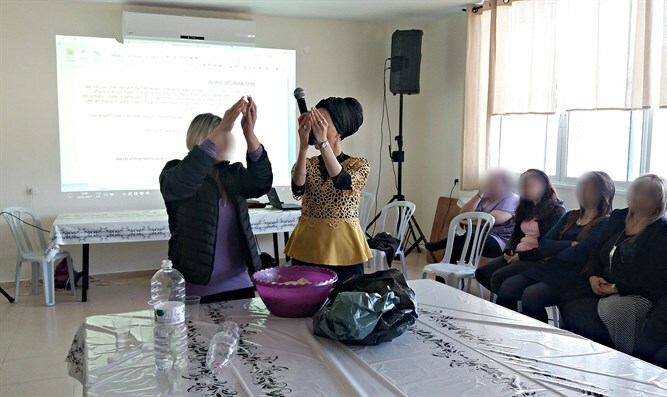 Women living in southern Arab village connecting to Judaism wished to celebrate proper Passover Seder; Yad L'Achim enlisted for mission. The motto chosen by the Yad L'Achim Association many years ago - "Don't give up on any Jew" - took on special significance this Pesach. "Seventeen years ago, two religious women discovered that their biological mother had given them up for adoption, married an Arab and established a family in an Arab village in southern Israel," says Shuri Kostelitz from . A few years ago, those girls, who decided not to give up on their mother, found her, made contact with her, and were even introduced to two stepsisters living in the same Arab village. Over the years, the two tried to draw their mother and sisters closer, and managed to keep in touch. Recently the mother's medical condition began to deteriorate and she became an invalid. "The daughters asked us to help the mother return to Judaism so that she could be buried according to Jewish ritual," says Yad L'Achim. "Of course, we immediately contacted the mother and her daughters and began a rehabilitation process with a social worker who helps them emotionally and strengthens their Jewish identity." As part of their approach to Judaism, accompanied by Yad L'Achim, the women who lived in the Arab village in the south of the country wanted to celebrate Passover as authentically as possible. Yad L'Achim enlisted its staff for the mission, and a special vehicle with the volunteers arrived at the outskirts of the village in which the women live, met with them, and provided them with matzos and other Passover needs so that they could hold their first Seder in the village.